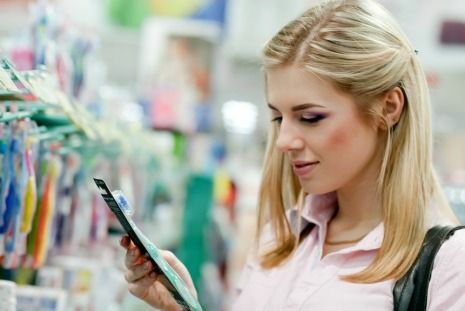 We’ve compiled a list of our top 5 adult dental product recommendations for adults based upon your most frequently asked questions about products for daily oral care between professional teeth cleaning visits. Electric toothbrushes when used correctly are superior to a manual toothbrush. 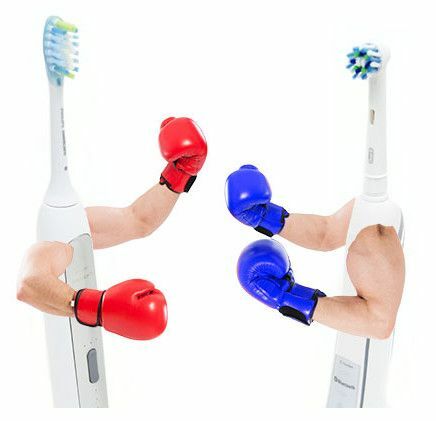 Sonicare vs Oral B…which is better? In a nutshell, both are great! Both have extensive, clinical research to support their superiority and effectiveness in comparison to using a manual toothbrush. Electric toothbrushes help to easily reach hard to clean areas. Oral B users can elect to purchase a power brush tip that helps to clean between teeth. I polled our team..and the results were 50-50. Both are effective. Click here to read a previous blog post where we discussed electric toothbrushes in greater detail. From time to time, dental distributors make available special product bundles at a reduced price. 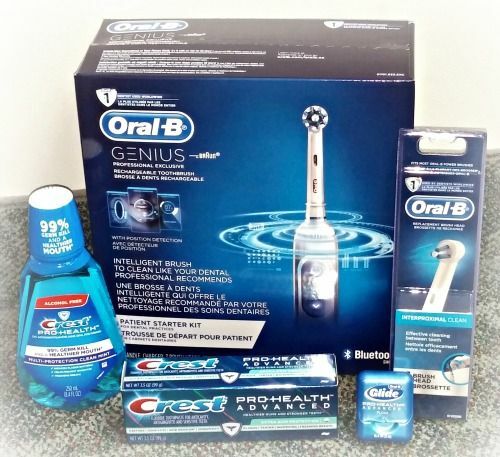 Dentistry for the Entire Family purchased a limited quantity of Oral B’s Patient Starter Genius bundles. At retail, the Oral B Genius is $159, our price is $102. That is a $57 savings over retail…and to sweeten the deal even more, Oral B has a $20 Genius rebate promo offer right now. This means that you could purchase the latest Oral B electric toothbrush at a $77 dollar savings for a purchase price of $82…roughly for 50% off! We only have a limited number available..so call (763) 586-9988 to reserve yours today! Early research shows that water flossing is almost as effective as traditional string dental floss. Whichever method is easier for you, is our recommendation. Most common frustration our dental hygienists hear is how difficult it is to access, coordinate their finger movements in trying to slide the floss between their back teeth. The struggle is real and a water flosser can definitely help. 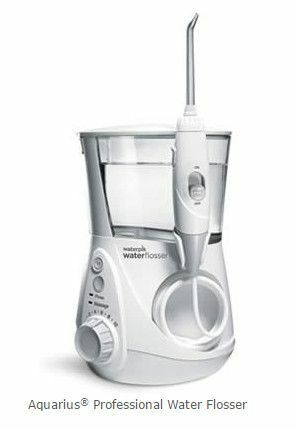 The rotating tip on the water flosser is slim and can be easily pointed in between back teeth after a little practice. 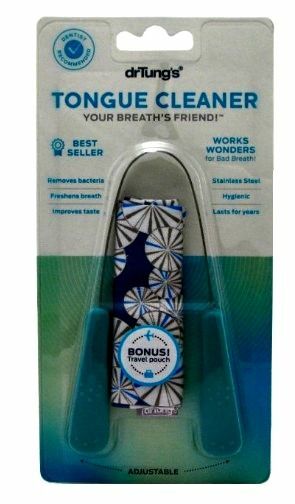 An added benefit to the water flosser is the option of filling the reservoir with an antibacterial mouth rinse like Listerine or Crest Pro Health rinse instead of water. Your dental hygienist can show you how to redirect the tip to irrigate any deep pockets in your mouth to help reduce bleeding gums and inflammation. Cleaning your tongue daily helps reduce bad breath, promotes oral health, and enhance sense of taste. Your tongue harbors over 300 strains of toxins and bacteria. The crevices and coating on your tongue contain harmful bacteria and toxins that can cause bad breath. You may have been taught growing up to brush your tongue with your toothbrush after brushing your teeth. This is fine as a kid, but not effective enough as an adult. A tongue cleaner or scraper removes more harmful bacteria and toxins from the crevices and textured surface of your tongue better than the bristles of a toothbrush. Our hygienists always encourage patients to try it for themselves at home. 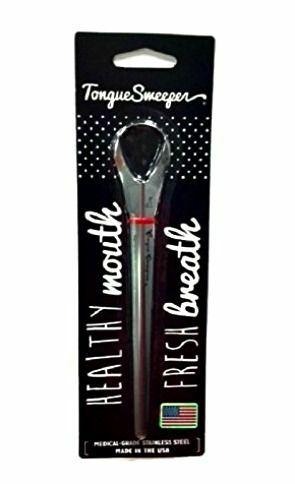 Most people are skeptical at first and are in shock how much better a tongue cleaner works with a single use. Fair warning: You may also be a bit grossed out by how much debris was present on your tongue prior to use. Often a single use is all it takes to make tongue cleaning a habit with a tongue scraper or cleaner. Ideally, use your tongue cleaner/scraper nightly before bed. To begin, hold the two ends of the tongue scraper in both hands. Extend your tongue and place the tongue scraper on the surface of your tongue as far back as is comfortable. Gently pull the tongue scraper forward so that it removes the undesired, coated surface on your tongue. A helpful tip is to use the scraper similar to using a household leaf rake…short, small strokes pulling all the bacteria forward. For smaller models, tongue sweeper featured right, it will be necessary to work in sections to effectively clean the tongue. Our hygienists prefer two handed tongue cleaners (similar to Dr. Tung’s model shown above right). Tongue gel? Is it necessary to use? Some tongue cleaners come with tongue gel. The tongue cleaner itself is what is cleaning your tongue, not the tongue gel. That said, it does not hurt to use it if you wish. Some patients have told us it makes to mask the “gunk” removed from the surface of their tongue. It’s totally up to you. Professional teeth whitening from your dentist can brighten your smile up to 8 shades brighter! Do you enjoy drinking teeth staining beverages and foods like coffee, tea, red wine, etc? And want white teeth too? 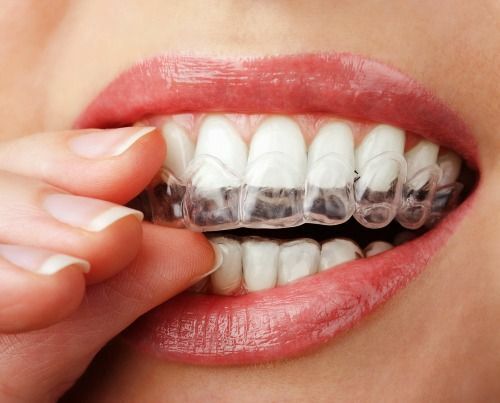 Professional teeth whitening may be the best option for you. Professional teeth whitening options are safe, effective, and highly concentrated. On average, patients who have in office teeth whitening have brightened their smiles up to 5 shades brighter! In a single, two hour dental visit with one our specially trained dental assistants, your smile can be brightened up to 5 shades brighter! Click here to learn more about in office teeth whitening. 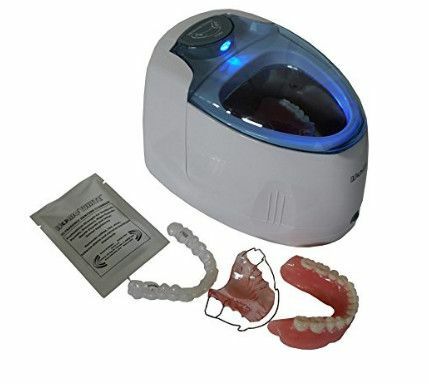 DIY teeth whitening at home with professional results, 45 minutes daily for two weeks. Two short dental appointments are necessary. One appointment to take impressions of your top and bottom teeth. These impressions will be used to fabricate custom teeth whitening trays (pictured above). The dental assistant will deliver your trays and review home teeth whitening instructions at your second dental visit. Prescription strength Crest White strips are available for purchase. An ultrasonic cleaner designed specially for dental appliances. Compact ultrasonic cleaner used to disinfect and remove food particles from dental appliances. Pictured right is the iSonic F3900 available at major retailers & on Amazon.